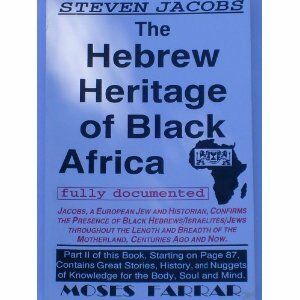 Steven S. Jacobs (European Jew) has chosen to inform the general public about an ancient Hebrew heritage, which exist for many West Afrikan ethnic groups. He says on pages 14-15, "We in America tend to associate the word "Jew" and "Hebrew" with White people because of our European cultural conditioning. A trip to the State of Israel would dispel this notion immediately. There you will find Jews of all colors and ethnic backgrounds living side by side. And historically we can read in our own history books on African history that Black Africans, e.g. the Falasha of Ethiopia, were Jews long before Christianity or Islam made an appearance on the scene. "The White man, as is logical of human nature, has written and interpreted history largely from his own point of view." Steven S. Jacobs concludes on pages 16-17, "The history of Israel has been handed down to us mostly from White scholars. As a result, the emphasis has been put on what ties Europe and Europeans to the Middle East. The possibility of a relationship between Black Africa and the Middle East is rarely mentioned." "The bias in our knowledge of history runs deep. It is reflected, for example, by the fact that little space is devoted to the historic and theological kinship between Christianity and the so-called pagan Greco-Roman religions of 2,000 years ago. It also is reflected by the fact that relatively few books deal with the non-Hebraic ancestry of most White Jews who are descendants of Greeks, Romans, Armenians, Berbers and others who adopted or converted to Judaism during the period of its greatest expansion in the Mediterranean area before the Christian era began. Certainly, few White historians are able to plumb the depths of anguish and despair suffered by Black Africans who, like cattle, once were herded to the Western Hemisphere as slaves." "No single book can deal exhaustively with any subject so that every facet and opinion is recorded therein. Our book is no exception. It is not written to rehash old viewpoints and biases. It is not to rewrite of White history in Europe or the Middle East. Our purpose among others is to redress what we believe is a long-standing imbalance in the presentation of Black history. We want to introduce you and every reader to a part of Black history which cannot be found in the standard texts and treatises on the subject. Black Americans now are in position as never before in modern history to rediscover, and reclaim if they wish, a heritage which has profoundly influenced world history and mankind: the Hebrew heritage of Black Africa." I have quoted the majority of Chapter 2, pages 14-17 because I feel that the Sovereign Yah (the short poetic name of Yahweh) has purposed the work of Steven Jacobs to fulfill a void which has always been present in historical research, and scientific reality. Steven S. Jacobs' message is motivated by the love of Yah [The Spirit of Truth], whose purpose is to redeem the lost sheep of Yisrael (Israel). Revelation 7:9-10, After this, I looked; and there before me was a huge crowd, too large for anyone to count, from every nation, tribe, people and language. They were standing in front of the throne and in front of the Lamb, dressed in white robes and holding palm branches in their hands; and they shouted, "Victory to our God (YHWH), who sits on the throne, and to the Lamb (Yahoshua)!